Working with local small business owners gives me a chance to see what happens “behind the scenes” in their operations and makes my job interesting. 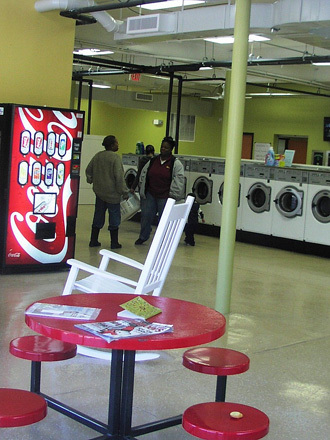 Fiesta Laundry was a great project for two reasons — I learned a lot about how Laundromats work and got to help transform an under-utilized, basement warehouse space into vibrant new business. 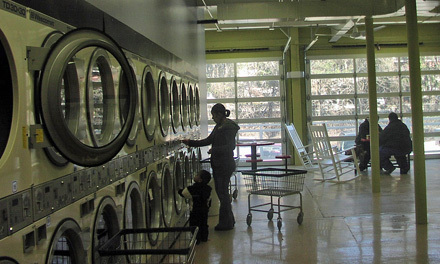 The owners of Fiesta Laundry realize that doing laundry isn’t an activity people look forward to doing, so they aim to make the whole experience more enjoyable by adding amenities like automatic entrance doors, children’s play areas, wall-mounted televisions, and table seating, vending areas, and whimsical wall art. The walk-out basement location made coordination of ventilation and plumbing systems complicated so we decided to play it up and show it off as a design feature — exposing the concrete structure and mechanical systems throughout the laundry space. 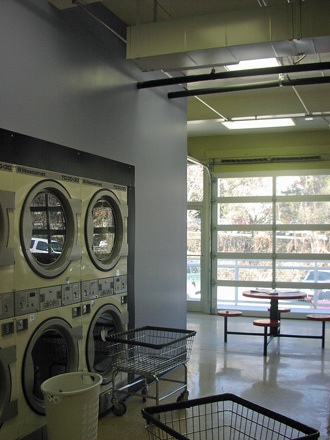 Large existing windows and door openings facing the parking lot keep the laundry area bright and airy. 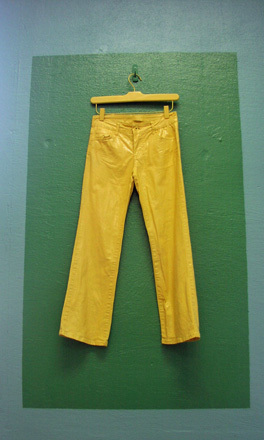 Also during the design process, we explored a number of energy saving and alternative energy options, and ended up incorporating water-efficient washing machines, energy efficient lighting and machine controls, and an instantaneous gas-fired water heating systems that will allow for a future solar hot water add-on. My favorite part of this project is the customer seating area located in the former truck dock space. 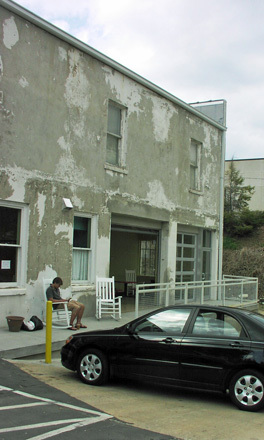 There, glass-faced garage doors were installed and an exterior concrete walkway was added so that during nice weather, folks can sit outside and enjoy the day while they wait for their wash cycles to end.